> CenturyLink > How to reduce time-to-market without increasing capital expense. In 2013, IEX set out to build and launch its business from scratch. Their goal was to create a brand new class of trading system, offering a fair-access platform to any qualified broker dealer and providing a more balanced marketplace via a market structure and cutting-edge technology. IEX sought a partner that could provide the “best of everything,” all under one single contract. That meant finding a provider that could deliver mission-critical infrastructure, connectivity to the broad financial ecosystem, high availability and high power density. And, most importantly, it meant finding a provider that could reduce its time-to-market, reduce IT capital expenditure and be cost-effective for the long term. That’s why IEX selected a broad range of services from CenturyLink Technology Solutions. 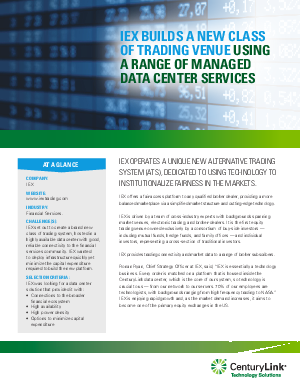 Read, “IEX Builds a New Class of Trading Venue Using a Range of Managed Data Center Services” now and discover how IEX partnered with CenturyLink to break the mold with its new trading system.